The Matador was a stately styled coupe/sedan/wagon that replaced the Rebel in 1971 as American Motor Corp's plus sized muscle coupe. In 1974 the Matador coupe was restyled in a completely different fashion from the sedan and C(the)BS News lists the Matador on their list of the World's 15 Ugliest Cars. Ignore those philistines, because Francisco Scaramanga used a flying version to escape James Bond in The Man with the Golden Gun and a Matador coupe deserves a spot in your garage. 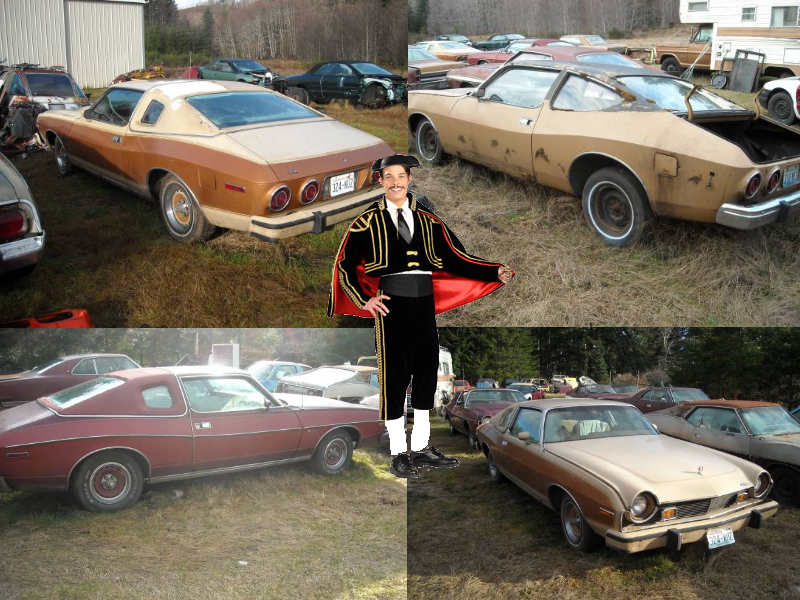 Find these 1977, 1978 & 1975 AMC Matadors offered for $2,500 (for all three) here on craigslist, located near Seattle, WA. Tip from Gianni. By 1977 the muscle-car era was on its way out and the replacement cars tended to be softer, slower and are generally less collectable today - but don't rule them out of your classic search as they are also considerably cheaper. You can read all about the 2nd generation Matador coupe here on matadorcoupe coop, but this seller also has a few Gremlins for sale. Is this the automotive equivalent to the Crazy Cat Lady? I wonder if he just kept coming across these things and could not resist, or did people drop them on his doorstep? I have a friend in France who would up with 64 Citroen 2CVs that way. At the time, people thought he was half-a-bubble off level, but now he is a respected source of good original parts. Time and perspective, I guess. Sadly, I don't think 1970s AMCs are headed for the big time any time soon. They were not exactly the pinnacle of auto technology even when they were new. There were few attractive cars built in the 5mph bumper era, and this wasn't one of 'em. "Why were these balls so much smaller than they were yesterday?" "Well, the Matador doesn't always win." Regarding the Gremlins... that's got to be the longest stretch in advertising truth I've seen in ages. The two are "basically complete but require restoration". That should read "basically complete piles of s**t". There's nothing complete about that blue one in particular. The parts car looks more complete than the other two combined. In my opinion, stock Matadors are not in any way rewarding to drive other than if you're an AMC fanatic or you can't figure out any other way to get a 401. That I get, but to own one because you think it's a good car to drive...not so much. Nonetheless, there were some interesting variants. Can any Matador be considered cool? Check out this picture and decide for yourself. 1974 AMC Matador Oleg Cassini edition, 401 with 55K for $15,750. Wow what a nice looking car after all the cheese is removed. Looks a little like one o' them big Ferarris. I've always thought these were the ugliest cars ever made. Then I saw that orange one at a show. It's super cool. Remove the bumpers and brougham crapola, fill the wheel wells, and you can see that the designers had something going on. Adam 12 had Matadors but the above picture is a Plymouth ! Oops. That's what I get for being on too many blogs like this all at once. Got my Plymouths and AMCs crossed up. 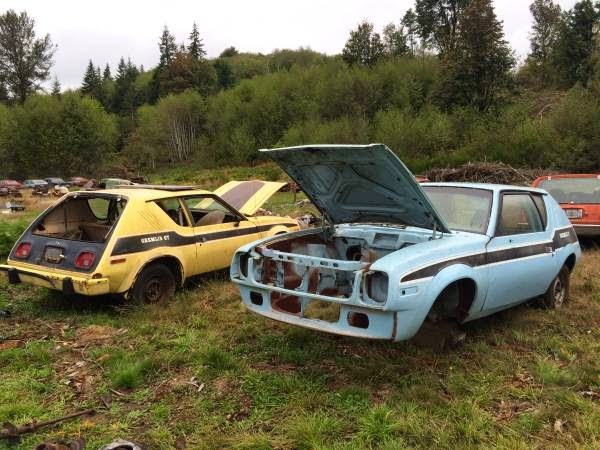 The Gremlin GT is a very rare car... the blue one may be incomplete, but the body is rust free and should be saved.